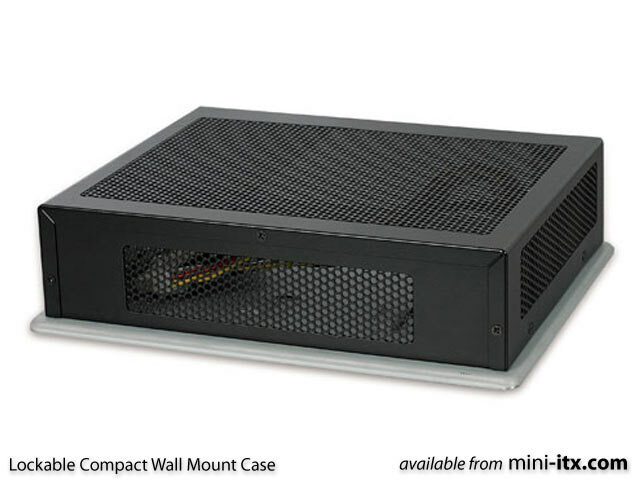 Compact and Rugged Wall Mountable, Lockable and Removable case suitable for all non-socket Mini-ITX Boards - Universal 110-240V operation. Constructed from steel and lightweight aluminium and measuring just 66 x 251 x 200mm (HxWxD). 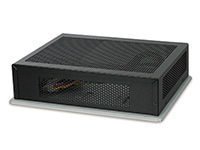 This case is ideal for POS or Kiosk applications, or for any application where a discreet and securable but quickly removable case is required. Strong wire mesh venting on 4 sides provides maximum airflow. Internal mounting bracket for 2.5in HDD. Or why not make a fanless solid state system and boot over a network, or from IDE Flash Module. 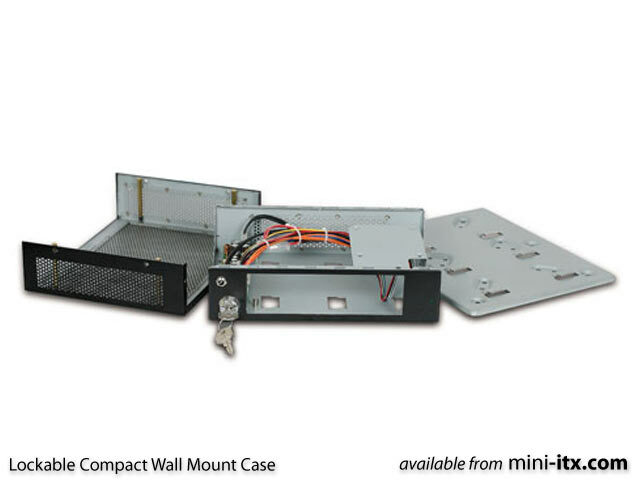 Locking system: 200 x 250mm steel tray included with 18 separate Wall/VESA mounting points and 6 notches to 'hang' the case in place. 2 provided keys operate a bolt which secures the case firmly to the tray. The top of the case is screwed in place at the top, bottom and sides. The case must be unlocked from its tray and 11 screws unscrewed to remove the contents. Rear Panel: DC Input, Key Lock, I/O Shield Slot; Green Power LED; Recessed Power and Reset Buttons (operated by a paper clip). Punch-out for Serial port (DB9) connector. Front, Top and Side Panels: Strong Mesh Venting. Power supply included: 110-240V External Universal 60W AC Adapter and UK power cord; 62W Internal DC power board. Power connectors: SATA Power; Molex Floppy; Molex HDD; 4pin 12V P4; 20pin ATX. Supported boards: All Embedded (e.g. Atom, Celeron Bay Trail) Mini-ITX boards with ATX connectors.